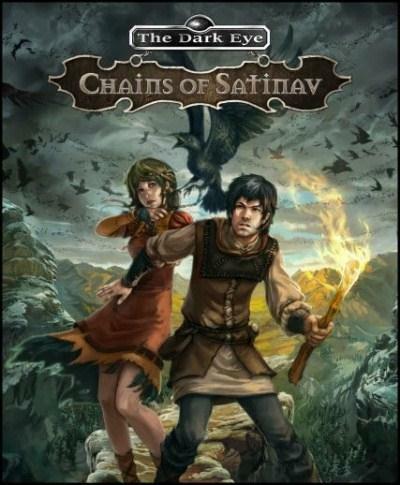 The Dark Eye Chains of Satinav ( 2012 ) Multi2 v1.1.26 Repack by RG Mechanics | Free eBooks Download - EBOOKEE! Posted on 2013-12-20, by naveennisha. History of The Dark Eye: Chains of Satinav develops away from Aventura . The protagonist , a young trapper Geron , lives in a small kingdom in the north - west, called the Andergast . The inhabitants of this remote region are very superstitious - there are signs on almost any event . When the King is waiting for the ambassador of a neighboring kingdom , to put an end to the centuries-old feud , residents plagued by swarms of aggressive attacks strange crows . The victims of the attacks have also claimed that the birds bring nightmares . Governor does not want to see this " minor " problem prevented the negotiations , so hiring an experienced hunter, that he figured out the problem . Heron, all his life haunted by failure , sees this as a chance to change their destiny , so that goes to the king, in order to propose a candidate for this important job . Only here the mission was a lot harder than it seemed at the outset, and its performance even makes a guy off the ground Andergast . Gameplay The Dark Eye: Chains of Satinav made ? ?in the best traditions of the point-and-click quests - detail traced locations , weight puzzles , extensive inventory and a host of colorful characters. Great music and the wonderful voice of the characters provide unmatched atmosphere of the game in the best traditions of the genre of fantasy. Immerse yourself in the fantastic world of Aventura and experience the dizzying adventure , recreated by authors of popular role-playing game The Dark Eye. From the creators of the game , " The Day After Tomorrow " and " Missing Peace ". No comments for "The Dark Eye Chains of Satinav ( 2012 ) Multi2 v1.1.26 Repack by RG Mechanics".